I thought it would be fun to ask the girls who work in the shop what was on their crafty wish list right now. I also thought it would be fun to give away one thing from each of their lists to you! Twinkle Sews! : I saw the origami shirt and fell in love with this cool detailing. So many other amazing patterns and styling! Leave a comment here letting me know what’s on your crafty wish list right now and you could win a copy of Twinkle Sews! This book is filled with really awesome clothing and contains a cd with all the patterns on it. Don’t forget to include your email address so that I can get in touch with you, if you win. Comments will close on Sunday at 6pm EST. I’ll post the winner’s name on Monday with the next list and giveaway. Feel free to enter each of the four giveaways, but you can only win one of them. Oh my this book is amazing. Fingers crossed it gets added to my colection. As for my list, this year I have mostly cookbooks and photography books on my list. A Year Of Mornings by Maria Vettese, Stephanie Congdon Barnes and Baking by James Paterson. what a great giveaway! On my wishlist is a lot of Nani Iro! I love their new line of vintage inspired fabrics! well good morning Miss Kayrn. I love a good contest. I wish for a Stylish Dress Book 2, some good quality wool felt, and the Twinkle book! If I don’t see you have a great holiday!!! Oh, and did Reva have her baby???? that book looks fantastic! on my wishlist is a dress form, a canon dsl (not crafty necessarily but good for taking pics of craftiness), and now that twinkle book! My wish list includes a couple of small things – a new sewing machine and a big cutting mat – oops, those are both big things! Happy Holidays! I(heart) twinkles… I just love the name….. Well I hope Santa brings me the needle punch accessory kit for my bernina because I really really really want to do some felting! Have a fabulous holiday and a peaceful christmas. Hello and thanks for a fun giveaway. I frequent the blog and store often-I love your fabric collection-best in Toronto in my opinion! As the winter weather blows in I wish for more time to finish all my crafty things to do for 2009 (including all the holiday gifts)! But on the top of my wish list are new Gingher scissors-i’m all about the basics. Have a wonderful Holiday, and thanks for the giveaway! jerisse with the cool hair! I wish for a Stylish Dress Book and the Gentle Art of Domesticity. Oh, and some embroidery cotton. 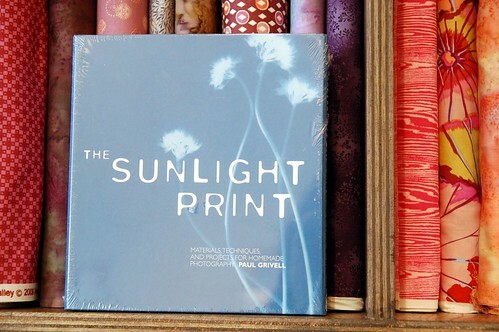 I used to do Sunlight Prints with my mom when I was a kid, they are so much fun! I wonder what they would look like with knit lace patterns…. – more of the City Limits print…sigh…It makes me actually want to hoard it. I think this list is already getting out of control! I also just bought Jenny Hart’s Embroidered Effects and Rashida Coleman-Hale’s I Love Patchwork, and both are really fun to peruse. fabric & yarn, of course. i would also like to be much, much better at sewing but i don’t think santa can give me that. csiu[at]rogers[dot]com is what I meant to add. My wishlist is the same as some answers above – nani iro and more time. But I would say no to some wool felt japanese masking tape! Would more time be a possible gift? I have so many competing crafty interests that I don’t have enough time in the day to do them all! My big ticket wishlist item this year is a Bernina serger. Yes. I’m determined to collect enough gift cards for theworkroom that I will treat myself to the beautiful machine! Jerisse: you have such fabulous taste in fashion and am not remotely surprised that you love Twinkle Sews. Hopefully see you all soon! Ohhh my that book is on my wishlist!! But other than that, I would say a “checkup” for my sewing machine is #1 on my crafty wishlist, it’s been too long since I had it professionally serviced and now it sounds like a train when I sew. And then, #2 would be really dreamy, and that would be a few yards of a Liberty print. On the more boring side, I need more pins, a new seam ripper, and new marking pens and chalk. And more time to sew all the beautiful projects I have the fabric for already. Karyn! this is so fun for the holidays! on my crafty wish list, I wish for fabric to make curtains for our new house. I don’t know what kind I should put up! But something pretty! A whole lot of stuff on my wishlist: fabric, yarn, a dress form, and several books, including In Stitches, Design-it-yourself Clothes, Sweet Nothings, Chic & Simple Sewing, and Twinkle Sews. I wish for some Liberty prints, and a snowy day all by myself to make them into something. Happy Holidays! My crafty wish list contains a bunch of books for both inspiration and technical skills and a needle felting kit (I really want to learn). I really want a couple of yards of Liberty tana lawn — I love sewing with it. And I want a universal walking foot. 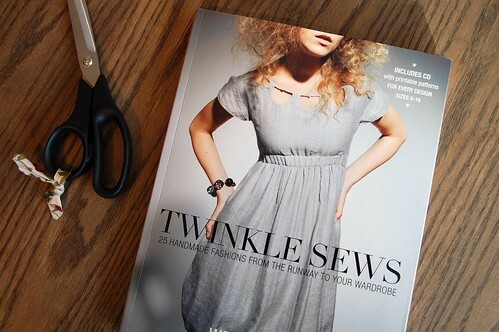 That very book, Twinkle Sews, is on my wish list! No kidding. I have one of her knitting books and was ecstatic when I found out she would be offering a sewing book. I’ve just taken a challenge not to purchase any clothing for a year’s time and would love to have this to preempt my sewing-to-replace-purchasing ideals! Thanks for thinking of this fabulous contest! Wow! I was looking into this book the other day and mentally added it to my wishlist then! Also, some stripy Tessuti fabric and some Rowan Kidsilk Haze yarn. Awesome Karyn, I’d love to win this book! My crafty wish list includes “I Love Patchwork”, “Denyse Schmidt Quilts”, and every print from Denyse’s new Hope Valley collection! I’m hoping for an online fabric gift card for Christmas so that I can make that last one come true! The Twinkle book looks very interesting, I haven’t seen it in a shop here yet. My wish list would be for someone to do my housework and cook the meals so I could have more time to craft and for a tardis-like cupboard to put all my crafty stuff in it so that it didn’t take up so much room. Oh wow, this book looks amazing. a little bit out of my sewing reach at this point, but I’ll get there! On my crafty wish list right now: hand quilting, the Summer Blouse from Weekend Sewing, make something (anything!) from one of the japanese sewing books I’ve been collecting and oogling all the time, sew the simplicity 2593 top pattern, make the butterscotch sauce from Smitten Kitchen, and the caramel popcorn from Orangette….mmmmm! Ooooh that Twinkle Sews book is fabulous. Finally a pattern book with great styles and styling – other than the Japanese pattern books. I’d love to win it. My wish list: the new Liberty prints for winter and more printed silk crepe de chine – I love wearing and sewing with it at the moment. Well, I would really like a long arm quilting machine – and time to use it! But I would settle for some Rouenneries fabric to make a spiderweb quilt. And perhaps some of those lovely Liberty prints! Love your blog – still have to make it to Toronto to check out your shop one of these days. 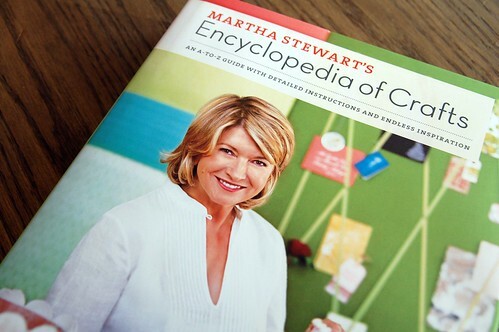 Thanks for a lovely giveaway Karyn – the book looks amazing! Top of my wish list is a nice big pile (or even a little pile would be great) of Kaffe Fassett Liberty prints. So many to choose from – I love them all! I sound like I’m making this up but ‘Twinkle Sews’ is top of my book wishlist (I have a few other wishlists…)! The other gift I’d like most is the ability to sew in a straight line. Is this book by the same author that knits? Wenlan Chia??? I’m excited to hear she has a sewing book out. I love her knitting books and am sure this won’t be a dissapointment either. What would my life be without craft books & fabrics? ‘Less is more’ doesn’t apply here! Ohh, my crafty wish list. I’ve been especially good this year so I think a new machine is in order. Oh, and a revamped sewing space! I would love to add Twinkle Sews to my collection, I have all of Wenlan Chia’s knitting books, she is an awesome designer. My wishlist is lightyears longer than I have time to be on this planet :-), but my top three, this month, are – Firstly some Liberty Umbel in grey to make Blouse 1 out of the One Piece Blouse Japanese Craft Book (you can see it as book 5 on Japan Couture Addicts site); Secondly, a copy of Nani Iro’s Japanese Craft book and some yardage of her luscious, super soft 100% cotton double gauze in a pattern of bright flowers in a watercolor style on a very dark navy blue background to make the dress on the front cover; and thirdly, for my boys, a copy of Melly & Me’s Magoo fabric monkey pattern, so I can make them one each…Magoo is my type of monkey! I could go on but I think this is long enough…GRIN! looks like a book i wouldn’t mind having! The Twinkle Sews book, Cal Patch’s pattern making book, a dress form and a giant table to work on! OOh, I want all of these things. I love your site so! I always find inspiration here. Plus it is a great way to take a break from writing my last 10 page paper of the semester at 2 in the morning. Handmade Home book by Amanda Soule. My only wish is fabric, fabric, fabric! 😉 Well, with some patterns to help me make somthing from it, hehe. I would love, love, Stylish Dress Book No.2 and the time to make everything in it. I would also really really like an overlocker. I didn’t know I wanted the Twinkle sew book until I saw it. But now I do! the only thing on my craft list right now… is my own sewing space in this house!! On my wish list is a dress form, size 8, painting classes with Tiffany at Glitter Pie, all of your Japanese Dress books, lessons at “The Work Room”, to open a “Work Room” East on Queen Street East at Beech Avenue, Revolution tea, a cleaning lady three times a week, five more hours in a day and rain boots. wow, what a fantastic giveaway! the only crafty things that i really want are liberty fabrics and a table loom. i’m so excited for this giveaway! wee! – dried lavender (for keeping the moths away)! I want to start making a Dear Jane Quilt in 2010. I figure one block a week while the new babe is sleeping is do-able. I’m sure I’m kidding myself. Thanks for putting on this contest. My crafty wish list would include an entire bolt of liberty fabric – any liberty fabric. Oh and a fat quarter each of the new Denise Schmidt collection. It’s always nice to dream up a wish list! Wow! This book looks great. Since we are expecting a baby on Christmas, I am wishing she is happy and healthy and loves all the toys I’ve made for her after having taken a class with you! Thanks for turning me onto sewing Karyn. You rock. My wishlist is for Nani Iro to re-issue some of her prints from previous years. I only discovered her recently long after they had sold out. Nifty! I’m wishing for Echino fabric for my kotatsu project. I would really like to learn to silkscreen. Angelune says I should say that my crafty wish is to take the men’s sewn tie class. I would love a serger, but that is not in the cards this year! More realistically, some Sew U books are on the top of my list. Thanks for the chance to win! I would love a large cutting board and a walking foot for my machine so that I can finally try quilting! Me, too! I want the Encyclopedia as well. I’ve gotten two items from my wish list already: Handmade Home and Creative Family by Amanda Blake Soule. More beads, more fabric, more time!